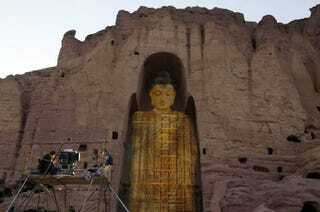 In March 2001, the Taliban destroyed the Buddhas of Bamiyan, a pair of giant statues dating to the 6th century in the Bamyan valley in central Afghanistan. Now, the statues have been resurrected with 3D light projection technology. A Chinese couple, Janson Yu and Liyan Hu worked to develop a projector at the cost of $120,000, which they first tested in China before bringing the system to the UNESCO World Heritage Site this past weekend. With the permission of UNESCO and the Afghan Government, they were able to project a 3D image into the slots in the cliffside that housed one of the statues. For the evening, the statues stood once again in a symbolic work of art. While the statues are physically gone, they cannot be easily erased from our collective memory.